Just regular folks. : Velvet cake. 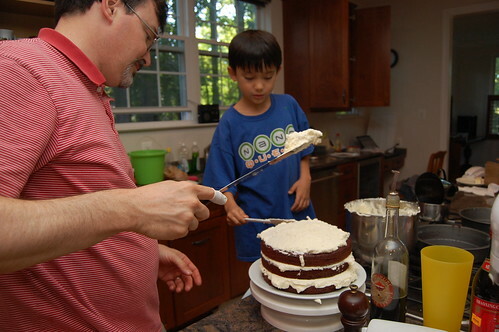 When I first met Jeremy (now more than 13 years ago), he already owned a whole cake shop's worth of baking equipment. He owned the Cake Bible, he introduced me to cake flour and also to the concept of weighing baking ingredients rather than measuring them out in a measuring cup. We have not baked in a long time. All the baking tools have been packed away for over 3 years. 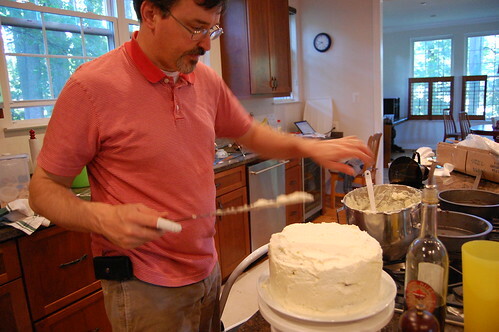 This Labor Day weekend, we spent a few days making a red velvet cake. We tried making this in Singapore for Emy's birthday, but in the middle of baking, the power went out for 3 hours and the oven turned off, so I never got to try the red velvet cake in its full glory. On a political note, I was relieved to hear that Trig is not the grandson of Sarah Palin as first rumored by various bloggers. I think that Ms. Palin will prove to be quite appealing to a good number of people, lets see how she does tonight. I have the cake bible and I LOVE it! so how was the cake?